No space in the library to cram for finals? 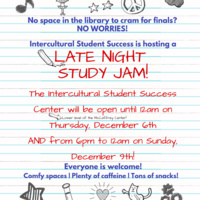 Intercultural Student Success will be hosting a Late Night Study Jam. The Intercultural Student Success Center will be open until 12 a.m. on Thursday, Dec. 6. AND from 6 p.m. to midnight on Sunday, Dec. 9! Comfy spaces | Plenty of caffeine | Tons of snacks!